This is what we (mostly Dustin) have been doing for the past month or more. It was a long, interesting harvest this year. Dustin got a new combine; however, it did not work well for the first several weeks. I tried to take Kimber to the field as much as possible because he loved every part of harvest. He has since taken to playing with his combine, having it dump in the trailer and taking it from the trailer to the 18-wheeler. Here is a picture of the corn harvest. Pop and Kimber on the gator. Kimber loves to "go fast" and Pop is always happy to oblige. I love these next two pictures. You can see how much both love farming and each other. This is Kimber running toward his daddy about to get on the combine. 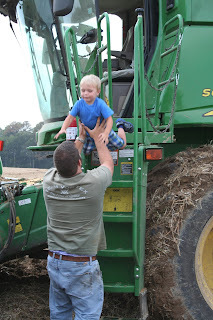 The second picture is Kimber jumping off the combine to Dustin. This is a picture of the bean harvest. Kimber had gotten so good at driving the combine that he knew when to swing the auger (the thing that takes the crop from the combine to the grain cart) and when to turn it off. Of course, he loves to push the buttons! This year we decided to go for a makeover/sleepover party. Addie Lee loved the idea and I did too! We invited four of her friends for makeup and sleepover and family for pizza and cakes. Here is my birthday girl. I cannot believe it's been FOUR years! AAAHHHH! We started by doing nails, hair, makeup and of course dress up clothes. Thanks to my sister, sister-in-law, and future sister-in-law for all the help! It was a real struggle for me to paint the toes! The girls loved all the stations. Addie Lee was most excited that she got to wear mascara! We also had a crown piñata filled with candy. Of course, this was a hit. These are four of the five girls. Look how beautiful they are all dolled up and ready to parade around the house. Aniston had gone home by the time of these pictures. The birthday cake. I decided to purchase a cake this year, it was just easier. I'm really liking easier at this point. Modeling some of her presents. This Barbie house is what Dustin and I gave her for her birthday. This was my sister's dollhouse when we growing up, so vintage! I did get new furniture to go inside. My sister and I had the best time going through the old furniture and other things. Many, many memories. We played with that house for probably about 10 years. Addie Lee has loved the house as well. The funny thing is that I was "hiding" it in Dustin's gun room. He accidentally left the door open one day that I was not here and the kids went in there and saw the house. When I got home AL said "I saw something in daddy's room". So, while they were in the bathtub I moved the house upstairs and when she went in there I tried to convince her she didn't see anything. My sister said that was mean; I thought it was creative! Addie Lee in her beautiful Aurora dress Amanda gave her. She loves it; however, it does throw off a lot of glitter! I cannot believe it's been more than four years since I brought her home. One memory I have is getting in the truck to go home from the hospital and looking at Dustin saying "what do we do now?" It's a crazy feeling knowing that something so small is counting solely on you. She has grown up to be much more than I ever imagined. She's so sweet, beautiful, and kind. We are so blessed. Well, I know it's been a while but here is my post on my big girl. 1. She LOVES school. She cannot wait to start again. She's like me in that aspect. 3. She loves dancing. She tried gymnastics for a while but really only like dancing. She shows out on the stage every year and cannot wait to dance on "the big stage." 4. She is a wonderful big sister. She lets Kimber know what he should be doing all the time. Bossy some say, but I call it a good big sister. 5. She cannot wait for the new baby and she says she's going to be a great helper. I know she will! 6. She loves to dress up. This is seen all the time. She loves to do her makeup, hair, clothes and everything that goes with it. 7. She loves barbies. I love to just sit and watch her. She has such a wonderful imagination and always has some conversation going on among all her barbies. 8. Although she has about 30 barbies she thinks she needs more! This is from me! I loved barbies when I was a child. 9. She hates to take naps. It is a lengthy discussion everyday. 10. She has a very sweet nature. She loves everyone and wants to take care of everyone. 11. I love the way she prays at night. She always thanks God for everything to try to make her prayer as long as possible. She does not like to leave out anyone or anything. Also, when she's praying for someone to be healed or feel better she says "thank you for healing ____________" or "thank you for making ____________ feel better". It is so sweet, I wish we all had her faith. 13. If there was any confusion, the word "sugar" is pronounced "suga". That's right, no "r" on the end of that one! 14. She loves television. We do not watch tv too much at the house but when it's on she is tuned in to it. It's hilarious because she's just like her daddy! 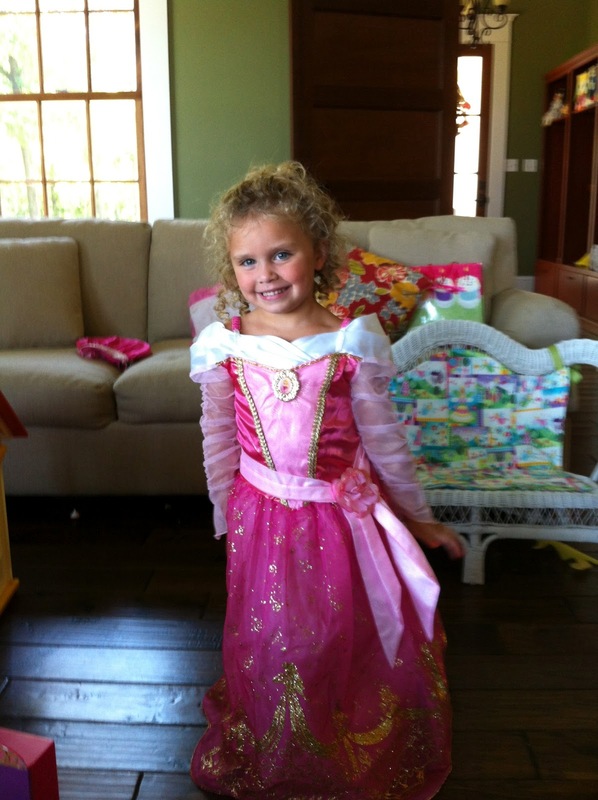 Of course, her favorite movies are princesses! 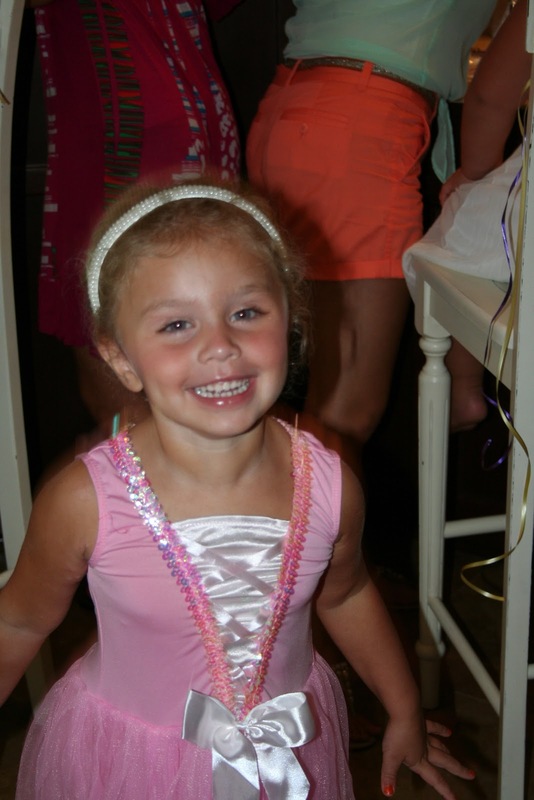 She'll always be my baby girl but she sure is growing up quickly. I'm so proud of her and the respect she has for others. She will start pre-k 4 next week and is so excited. I will post about her birthday soon. I'm so far behind! Sisterly love. This picture was taken one night when she was dressed up as a princess and Kimber decided to dress as a prince. We found his rubber boots (you can't really see in this picture) and he wanted a shirt and pants. Thank goodness he settled on his Buzz Lightyear outfit. 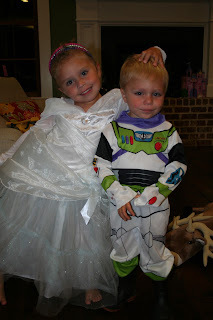 They danced and played Cinderella (where he "tears" her dress and chases after her when she loses her slipper). They play so well together (most of the time) and are so cute together. There are so many things I want to remember about my children at this stage so I'm going to post a little about each one. Today is all about Kimber. I will post about my girl next. 1. Kimber is very structured. He likes things a certain way and does not like change. You can say he's like me. He likes a plan. Every morning he asks "so what we do today?" He wants to know what's going on as much as I do. Kimber: I need tell you a secret. Me: (I lean down so he can whisper to me) What is it? Kimber: I need you...tickle me! And so I do! I love it! 4. He loves his daddy and loves to drive the combine. He likes to push all the buttons and make it work. He is actually pretty good at it. I think Dustin may have to give up his spot in the driver's seat soon. 5. He also is a mama's boy. He loves for me to hold him, tickle him, and just be with him. We don't' have to do anything special, he just loves me. 6. He is a very touch-sensitive person. When he's drifting off to sleep he will put his blanket in his mouth and proceed to rub it on his nose, arms, and each finger. It's a habit and I love it. 7. He doesn't really like to be around crowds. Again, probably from me. 8. Everytime he toots or burps he says "somebody burped/tooted", like it wasn't him. Then I'll say "who was it?" He'll fall out laughing and say "It was me!". May not sound funny but it's hilarious! 10. He thinks his sister is the best thing in the world. He loves to do just what AL is doing. However, he also has a mind of his own and does not let her push him around. He likes to play with her toys (or take them from her) just so she can't play with them. Such a boy! 11. When he really wants something he very sweetly says "please mama/daddy please me have __________"
12. He loves to ask "why?" but my favorite is when he asks "why not we have ___________". I know that's incorrect grammar but it's so cute. 13. When he is done watching a movie in the car he wants me to hand him the book of new DVDs and also the DVD that comes out of the player. He needs to see that one before it is put into the case. Again, he's quirky and I love it! 14. He has two pair of shoes. Each time I ask him if he wants another pair of shoes he points to his feet and tells me "I already have shoes". 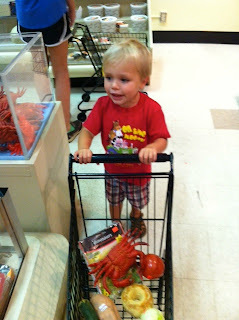 I was so proud of him because when Addie Lee came home with her new Skecher light-up shoes he said "I want a boy pair". So, we went online and ordered him a pair of light-up shoes too. Now he has 3 pair! He refuses to wear any open-toed shoes because he tells me "those are girl shoes". No flip flops, no sandals! My boy! I love him with all my heart! Harvest season that is...They started cutting corn yesterday and were busy at it today. I'll post picture soon because they have a new, enormous combine! She is obsessed with kissing on the lips and since the only way you can do this is to be married (yes, that's right, not before) she of course had to seal the deal with a kiss! Hilarious! She is getting such an imagination and I love it! She can play with her Barbies for a long time (just like me). Kimber refused to let me take any pictures of him, but he was dressed in the colors as well and looked very cute! Happy Independence Day! Special thanks to all of our veterans and their families for all of the sacrifices! Our country would not exist without you! will be......A GIRL! Yay! I tried to take a picture of the ultrasound because I don't have a scanner but that really didn't work out. But she is precious. Measuring just on time. Everything looks good. We will name her Audrey. We don't have a middle name yet, but soon enough. Addie Lee went to the scan with us and was very intrigued by the pictures. I think she thought she would see pictures like we take, but she was excited it would be a girl. I'm sure she will show her how to be a princess!